There have been many key innovation in the latest SAP S/4HANA 1610 suite in the core features of Finance & Logistics. In this blog I would like to focus on the ATP capability offered by S/4HANA 1610 & how we can be sure to call it Advanced Availabity to Promise or aATP & that can be a great option for clients who plan to have this core APO functionality with S/4HANA earlier known as gATP. Future roadmap from SAP in this area. Set up aATP in S/4HANA 1610. 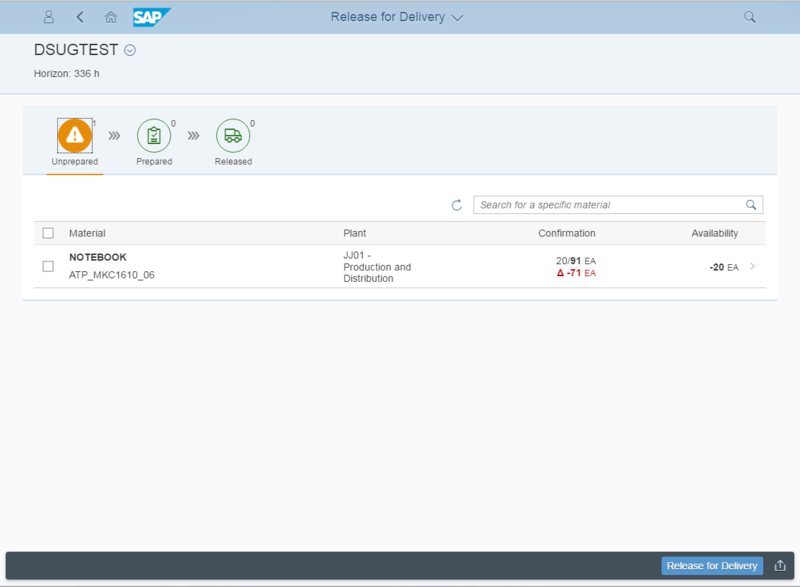 Bonus as of 1610 – New aATP Fiori apps. Difficult to fulfill customer orders on time with the proper quantity. Inability to promise accurate and reliable order dates. Inefficient strategies to fulfill orders from the entire network or to substitute products automatically. Inefficient strategies to sell scarce products in a fair manner. Inefficient ways to manage order backlogs. S/4HANA utilizes well the in-memory computing to find mass product availability for Sales, Planned & Production orders, giving business new levels of visibility. ATP check for all items of an order at once. Significant performance improvements for releasing large production orders. New concept of confirmation strategy. 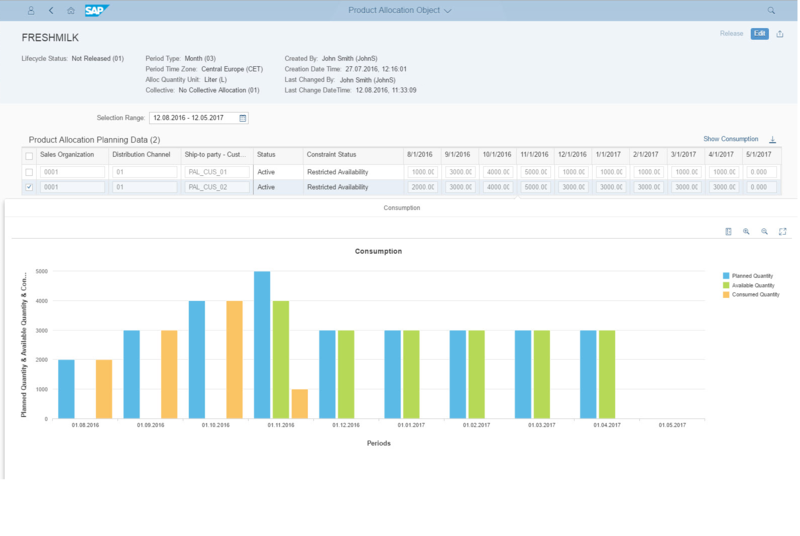 Product allocation in SAP S/4HANA has a completely new design and implementation based on neither SAP ECC nor SAP Advanced Planning and Optimization application. Supports the business decision if a sales order should be confirmed and, if yes, to which extent. aATP can be used for scarce product allocation based on almost any attribute of the underlying sales order, material, plant, or customer so that one can achieve maximum customer satisfaction as per set business rules. Grouping and aggregation capabilities (collective allocations) for simplification and ease of maintenance. Back Order Processing can be completed easily via Fiori apps utilizing requirement classifications that helps to identify & fulfill most critical orders in timely manner. New concept for requirement classification, like winner, gainer, redistributor, filler, loser. 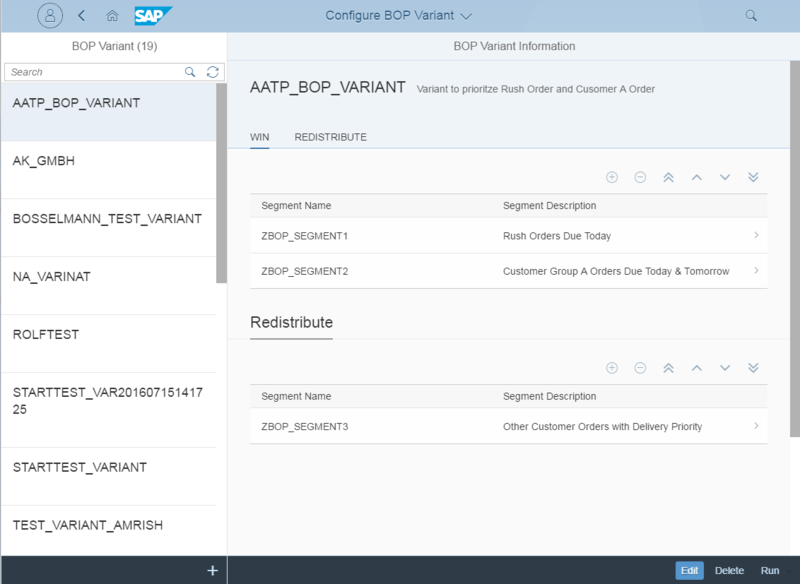 New SAP Fiori app to display the BOP result–result is displayed on different aggregation levels and allows an easy identification of (and fast drill-down to) confirmation issues. Fulfilling an order on time and in the desired quantity using different kind of checks for different business scenarios. SAP is planning key innovations further on below specific areas under aATP which we might see in coming time. Back Order Processing – BOP Analytics, Automatic exception handling (fallbacks), Provide extensibility features. Product Allocation – Extensibility and flexibility, Instance-based authorization, Alternative sources of supply, Analytics: explanation component, Modeling of constraints production and supplier capacity in multilevel scenarios, PAL for transportation and warehousing. Rules-based ATP (RBA) -Alternative plants (Determination of allowed alternatives, Mass check of allowed alternative plants, Selection of best-alternative plant). Integration of RBA result in SD sales order (Replace existing line item, Add additional sub items), Machine-learning capabilities in rules-based ATP. To keep it simple most of the configuration will be in-line with the normal ATP setup i.e. Defining Requirements Classes, Maintaining Checking Groups, Defining Checking Rule, Carrying Out Control For Availability Check. Most of these are available under Best Practice documentation provided with the release documents. There are 7 apps which have been introduced to harness the aATP capabilities in S/4HANA & we will discuss each of them one by one. With this app, one can create, find, display and change the schema for a product allocation object. The schema of a product allocation object comprises, among others, the ID and description of the product allocation object, periodicity, characteristics structure and their hierarchy, the unit of measure for the planned allocation quantity and the date time type (material availability date, good issue date and requested delivery date) used for the product allocation check. Create new product allocation objects. Search for, display and edit product allocation objects. Define the period types for product allocation objects. Define and order the characteristics for product allocation objects. With this app, one can maintain characteristic value combinations and planned allocation quantities for the time periods of the characteristic value combinations. Characteristic value combinations and the corresponding time series can be maintained by uploading CSV files. This app also enables to change the activation status, the constraint status of the characteristic value combinations as well as the lifecycle status of the product allocation object. Maintain characteristic value combinations and planned allocation quantities for their time periods. Use CSV files to maintain characteristic value combinations and their time series. 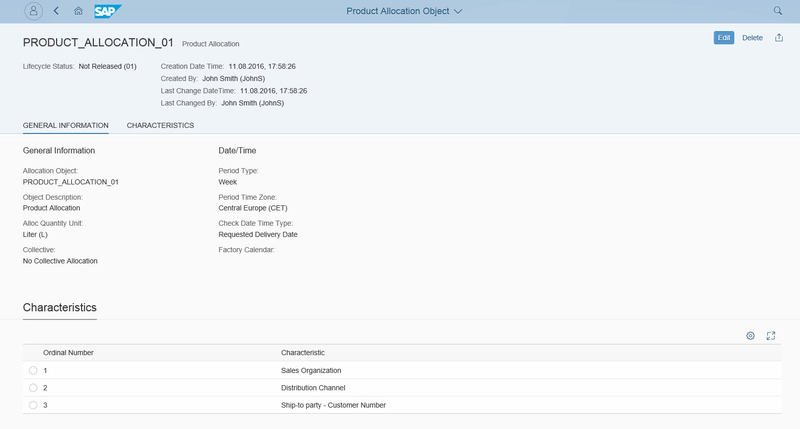 Change the activation and constraint status of product allocation objects. Display the availability situation (planned, available and consumed quantity) for the materials in product allocation objects. Release product allocation objects and their planning data for productive usage. With this app, one can assign materials and material-plant combinations to product allocation objects that were created in the Configure Product Allocation app and for which one defined planning data in the Manage Product Allocation Planning Data app. The assignment activates availability checks against product allocation for sales order requirements for the assigned materials and material-plant combinations. The assignment of materials and material-plant combinations is time-dependent and enables user, for example, to react easily to temporary or seasonal fluctuations of supply and demand. Assign materials or material-plant combinations to product allocation objects. Define validity periods for any assignments. Define the consumption range (number of backward and forward consumption periods), consumption unit and allocation factor for the product location assignments. With this app, one can define a set of rules with which to prioritize the distribution of supply when the demand for the materials in sales orders exceeds the available inventory or capacity. Using a combination of filters and prioritizers, you can automate rescheduling and redistribution in line with your company strategy. User can use the “Configure BOP Variant” app subsequently to create a BOP variant and execute the corresponding backorder processing run either directly in the app or in the “Schedule BOP Run” app. Define new BOP segments to prioritize requirements. Display and change existing BOP segments. With this app, one can define a variant for backorder processing (BOP), including an optional combination of filters and prioritizers, with which you can automate rescheduling and redistribution of materials in limited supply. 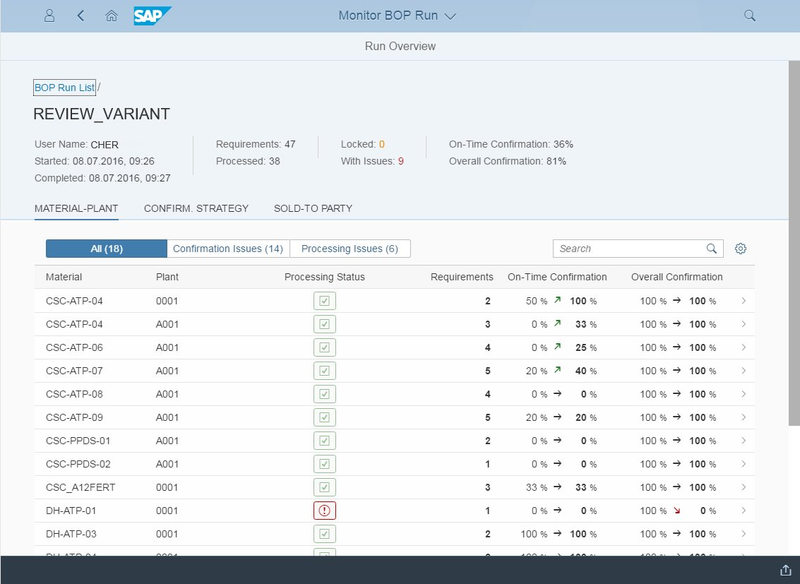 Results of the backorder processing run can be checked in the “Monitor BOP Run” app. Display, change and re-use existing BOP variants. Simulate and schedule backorder processing runs in one step. With this app, one can display the results of backorder processing runs that have been setup in the “Configure BOP Variant” app. The app shows the confirmation status of requirements at different levels of granularity, helping user to confirm that the backorder processing runs complies with your company’s strategy. If the results of the backorder processing run are not as required, one can change the setup of the corresponding BOP variant and execute the run again. Alternatively, one can use the “Release for Delivery” app to adjust the confirmation data manually. Display overall results of backorder processing runs executed in simulation mode or with document updates. Display data about backorder processing and confirmations at predefined aggregation levels by material-plant combination, confirmation strategy and sold-to party. Drill down to the requirement level to display the confirmation details. With this app, one can prioritize due sales orders containing materials with limited availability in the order fulfillment responsibility to which user is assigned. The app allows one to view the material availability situation of materials for which he/she is responsible as well as assess the potential financial impact of being unable to fulfill sales orders. This, in combination with other factors, helps one decide how to distribute material quantities between sales orders, before he releases the sales orders for subsequent logistics processes. Display sales orders containing materials for which one is responsible during a specific time period, including sales order items for materials with limited availability. Display the availability situation for the materials for which user is responsible. Display the potential financial impact for your organization if materials are not available and material redistribution is not optimized. Manually redistribute material quantities between sales order items, as required, to fulfill a sales order partially or completely. Apply confirmation strategies such as Confirm from Top to enable efficient, semi-automatic processing of mass data. Protect quantities of sales order items from further processing. Postpone further processing of sales order items. Release materials for delivery, thus triggering subsequent logistics processes (for example, picking). hope this proves helpful for the 1610 implementations pertaining to aATP. Good One Rahul, Consolidated Doc with a setup guide for all the new apps. 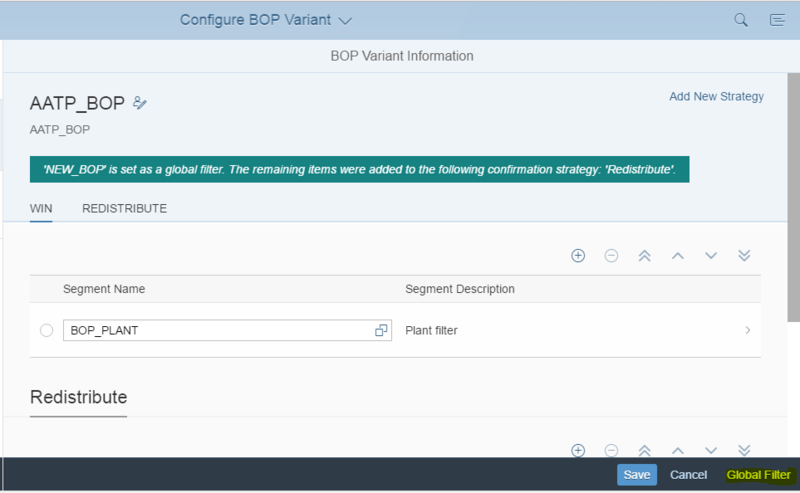 You could have also added information related to Global filter in Configure BOP Variant. Where You can restrict the selection further in the BOP run also have an added option to add remaining items of Global filter a particular confirmation strategy. Yes Global fliter helps restrict the scope of run. one Question – how to view the error of BOP-RUN status “RED !” ? any idea? @Kiran – as far as I have studied resource and component availability is not included in current version. At the moment, it is only plain PAL and PAC that is available and BOP respects both. Advance Availability topics like RBA, CTP, MATP are yet to be designed and developed. Currently, SAP is working on RBA Plant substitution. I guess you need to wait for ~1.5 years or so to see the AATP in good shape. Where/how can we check the eRRORs ? and why the processing status is RED ? Any NOTEs required to be applied ? I am wanting to understand KNOWN FIORI apps issues here. BOP runs fine when using V_V2 code. 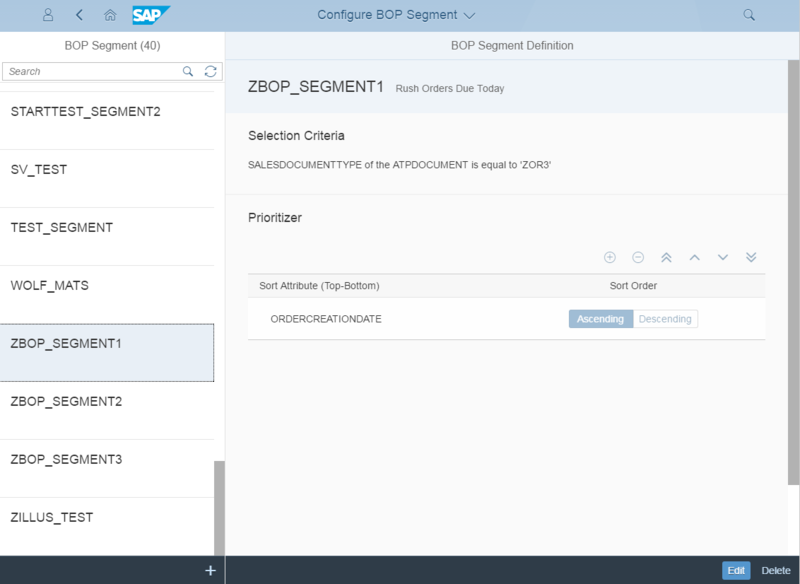 Please refer to note: 2400537 -Advanced ATP Backorder processing in S/4HANA. As suggested by Eric you need to maintain HRF for BOP to work correctly. Thx for reply. Yes HRF is activated. however still issue remains. What is the exact error message that you are seeing ? If the HRF has already been activated, the issue could be due to the way the Segments have been setup. Are you able to display the BOP results correctly, Monika ? Monika, you need to install the HANA Rules Framework and be careful since this involves extra license costs… without the HRF the BOP run will not work. In current S4 HANA 1610 aATP, There is no features of Dynamic BOPs which we have in GATP like. Are we going to have this functionality in 1709 release ? EDQA and ROC are not part of the roadmap yet. The current idea of SAP is that the Advanced BOP should be fast enough allowing you to setup the same more frequently ( like every 20 mins or so ). Any idea whether we are going to have RBA – location substitution will be available in S4 1709 Beta version ? Or any new functionality in 1709 beta version ? Whether Production allocation feature can be used independent of BOP for restricting availability of constraint product? Nice blog! I have one question. How S/4 HANA aATP and IBP for inventory are related with each other? What about characteristics-based availability check that is in gATP. Is this on the roadmap for aATP and if so, when?